The locomotive shed at Loughborough has served the GCR well since its donation by the RAF in the early 1970s, but unfortunately, it is feeling its age. The existing shed is becoming increasingly costly to maintain with cramped accommodation and very limited visitor opportunities and facilities. 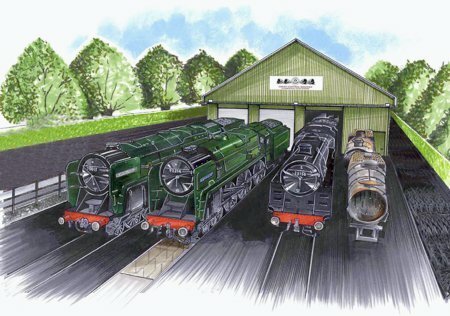 The new shed will offer enhanced facilities for the restoration and maintenance of our locomotive fleet. 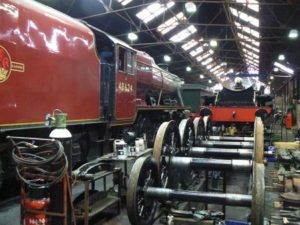 An extended machine shop will help make the railway more self-sufficient in manufacturing precision parts but also in retaining heritage skills that are becoming more difficult to find. The shed will also offer increased covered storage for the locomotive fleet, to minimise the effects of the elements which can lead to rapid deterioration. The centre will also look to vastly improve the working environment for our staff and volunteers which will help to attract and retain more apprentices and younger volunteers to our ranks. The centre will also give us the opportunity to transfer a wider range of rare heritage skills to our next generation of locomotive engineers. For the first time in GCR history, all shed activities will be accessible to the public with dedicated viewing areas, show points and interactive displays that will explain both the historical and engineering context of the activities undertaken. This will allow visitors to not only witness but become more engaged with heritage restoration in progress. programme linked closely to the National Curriculum. With these facilities, the railway will have an industry-leading facility which will allow for greater breadth and scale of engagement with schools, colleges, and universities. Raising funds with our Locomotive Shed Appeal Wall. In our new “Gallery” suite at Loughborough, we have created a Locomotive Shed Appeal Wall which will display plaques in recognition of donations received from our kind and generous supporters. Your unique plaque can be purchased for £200. We are working with our supporting charity, The David Clarke Railway Trust (Registered Charity No 1104839) on this initiative.